Learning the false shuffle is arguably one of the most important techniques you can have in your magician’s tool bag. This is Dan Garrett’s “The Underhanded Overhand Shuffle” (published by Dan Garrett) and it’s a variation of the “Hunter” false overhand shuffle. Many times you will a find an audience member who will not be satisfied with how you handle the deck during your magic tricks. They usually insist you mix up the cards again. This is an easy way to keep disgruntled audience members such as this happy without agreeing to their request. The overhand shuffle is common shuffling technique that even people who aren’t magicians commonly use. So this adds to the illusion that the false shuffle is all fair and above board. It’s important to not fall into the trap of re-watching the video and convincing yourself that the moves within the false shuffle look super obvious. If you incorporate casual conversation between you and the audience you will be able to avert the attention of the audience to the point it will go unnoticed. 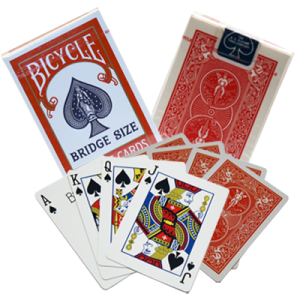 I usually try and ask the audience questions when I am pulling off a sleight of hand move, such as the false shuffle, as the audience is generally focusing on the answer to the question rather than the trick. Politeness suggests that they would look at me as I talk to them as it is a natural reaction. Just be sure to be as relaxed as possible while performing a false shuffle. The more relaxed you are, the better the sleight will fly by. The moves are easy but it will generally feel awkward at first as you are probably used to having that important finger in a different position. Just be sure to practice whenever you can, it’s great to practice when doing something as simple as watching T.V. It will feel natural in no time. 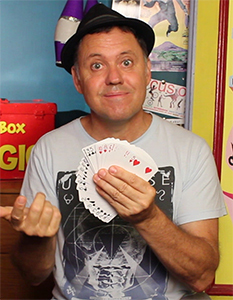 Did you enjoy this False Shuffle Trick? To learn more simple magic tricks Click here!